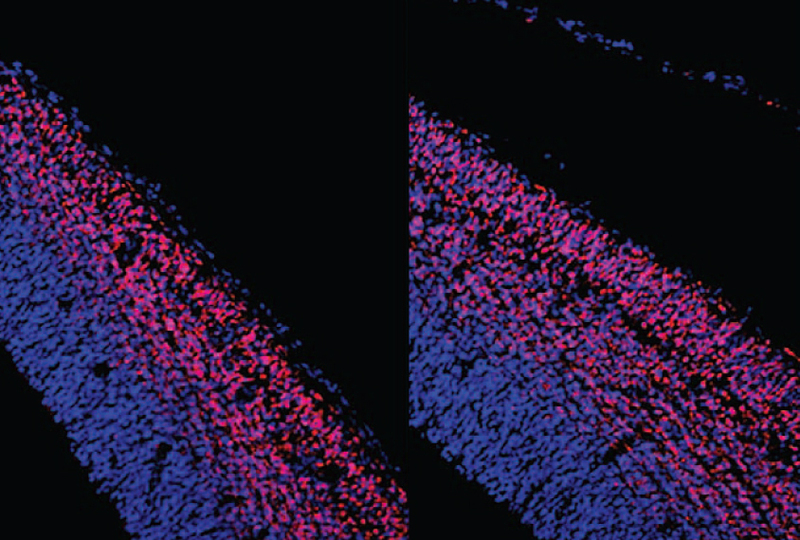 Surfeit of cells: The brains of mice missing genes involved in the WNT pathway (right) have more neurons (pink) than controls do (left). Brain cells derived from the skin of boys and men with autism share a host of unusual characteristics. The features include impaired signaling through a pathway that controls cell growth1. The findings suggest that glitches in this pathway, known as WNT, cause developing brain cells to grow too rapidly, and contribute to the unusually large brains that about one-fifth of children with autism have early in life. Each of the eight males with autism in the study has a different set of mutations in genes linked to the condition. So the findings support the idea that genetically distinct causes of autism nonetheless affect the same molecular pathways. “Despite the fact that their mutations are in different places and in different genes, their phenotype is the same — [their cells] basically proliferate faster compared to the controls,” says lead investigator Alysson Muotri, associate professor of pediatrics and cellular molecular medicine at the University of California, San Diego. Treating the cells with a chemical that enhances WNT signaling slows their growth to normal rates. This finding hints that a single therapy can treat autism of diverse causes. “Even if the cause isn’t the same, the treatment might be the same, because the same cellular pathways might be involved,” says Benjamin Cheyette, associate professor of psychiatry at the University of California, San Francisco, who was not involved in the work. Muotri and his colleagues collected skin samples from eight boys and men with autism and five typical ones, all ranging from 5 to 20 years of age. As toddlers, the boys and men with autism all had unusually large brains. The researchers reprogrammed the skin cells from both groups to create stem cells. They then coaxed the stem cells to become neural precursors — cells that can develop into the various types found in the brain. Neural precursors from the boys and men with autism divide more rapidly than do those from controls. They produce large amounts of RNA for FOXG1, a gene involved in brain development that has been implicated in autism. Many of the precursors also express markers indicating that once mature, they would send signals using gamma-aminobutyric acid (GABA), a chemical messenger that quiets brain activity. These findings jibe with those from a 2015 study in which cells from boys with autism showed striking similarities in three-dimensional cell cultures. Those cells also divided too quickly, made too much FOXG1 and predominantly became GABA-producing neurons2. Sequencing the participants’ genomes revealed that two of the individuals with autism have potentially harmful mutations in WNT pathway genes. And cells from the participants with autism show diminished WNT pathway activity compared with controls. Boosting WNT activity with lithium chloride normalizes the cells’ growth rate. These results replicate those from mice lacking genes involved in WNT3. Neuronal precursors in these animals divide more rapidly than usual in the womb, leading to enlarged brains as well as social problems and repetitive behaviors. Treating the mice with an experimental drug that activates WNT protects the animals from these problems. The similarities between the stem cells and the mice suggest that both are promising tools to study brain overgrowth in autism, says Anthony Wynshaw-Boris, chair of genetics and genome sciences at Case Western Reserve University in Cleveland, who led the study with Muotri. As the neural precursors from the boys with autism mature into neurons, they make fewer excitatory synapses than do those from controls. They also show a reduced proportion of neurons that produce GABA, and a drop in RNA from genes involved in GABA signaling. It is unclear why an abundance of precursors signal with GABA, whereas few mature neurons do. But the lack of GABA-producing neurons supports the longstanding hypothesis that autism involves too little GABA signaling in the brain. Neurons from the boys and men with autism show altered signaling patterns. As they mature, neurons from typical males fire faster, and eventually begin signaling in synchrony, reflecting the formation of a network. By contrast, the neurons from the boys and men with autism fire sluggishly and show less synchrony. “It’s almost like they are very immature compared to the controls,” Muotri says. Treating the neurons from the individuals with autism with insulin-like growth factor normalizes their firing rate. Cells from different individuals responded to the treatment to different degrees. Because of this variation, researchers might be able to use programmed stem cells to identify those most likely to benefit from an experimental treatment, Muotri says. Insulin-like growth factor is known to help neurons mature and ease autism-like behaviors in mice. It is being tested as a treatment for social difficulties and repetitive behaviors in children with autism or related conditions. Interesting. I have a very large genetic duplication over eight genes. One is called PACSIN1 which codes for neurons. My geneticists think it is clinically significant with my sensory and other issues. It is also perhaps a reason for the memory I have which is very excellent. I think the duplication is a good thing but that some environmental factor hit it and made it go wacky. I don;t think we should let the chemical companies have a free pass.